Last week’s episode of Glee preached the self-acceptance of mother monster Lady Gaga’s single, “Born This Way.” Creators Ryan Murphy and Brad Falchuk used the hour-and-a-half special to cram in as many subplots as possible, advocating various avenues of self-love in coming to terms with sexuality, OCD, and physical imperfections. 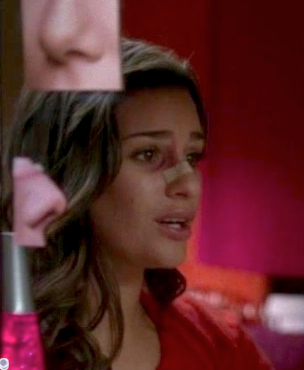 Revisiting a recurring reference of the show, Rachel Berry (played by Lea Michele) finds herself struggling with the option of rhinoplasty, even though her idol, Barbra Streisand, refused to go under the knife. The bossy, ambitious, and charmingly vulnerable Rachel gets served her own “Marsha Marsha Marsha” moment when she receives an accidental blow to the nose during a dance practice. Considering her deviated septum, a doctor suggests that it would be a good time for a “vanity adjustment.” Donning an impressive schnoz of his own, he reassures Rachel that his daughters had their noses done at sixteen and describes the cosmetic surgery as a “rite of passage for Jewish girls.” A conflicted Rachel, who has been consistently proud of her Jewish roots and concerned about her intended Broadway career, weakly offers, “But Barbra…” to which the doctor replies, “She’s also one in a million.” In other words, this is the norm, and Barbra, an unachievable ideal, is the exception. With hormones raging, Puck has been known to associate a “Jewish” look with attractiveness. In the Season 1 episode, “Mash-Up,” he first became interested in Rachel after his mom pressured him to date a Jewish girl. Thus ensued a kitschy dream sequence in which Rachel came into his room through the window wearing a shining Star of David, stirring in Puck the feeling that they were destined to be together because of their religious ancestry: “It was a message from God: Rachel was a hot Jew and the good Lord wanted me to get in her pants.” Presented through the same lens of religious observance, Puck has also said that his family celebrates Simchat Torah by ordering Chinese food and watching Schindler’s List. Murphy and Falchuk have taken many liberties in representing complex societal archetypes on Glee and Puck’s adolescent Judaic enthusiasm is just one example among the mix. While Rachel could have opted to change her appearance in order to have her “ideal” nose, she removed herself from the societal pressure and, in true Rachel fashion, continued striving full-force towards that other ideal: Barbra’s “one-in-a-million” success story. Channeling the legendary singer, Kurt tells Rachel that she herself is one-in-a-billion and if she were to get a nose job, she would be letting down all the little girls who will look at her beautiful face one day and see themselves. An avid Barbra fanatic herself, Lea Michele told US Weekly last year, “I’ve always been proud of my body, my Jewish nose and all of that.” Michele also told the New York Daily News that she never thought there would be a place for her on television, citing her very specific look as a combination of Jewish and Italian ethnicities. But what the twenty-four year old actress described as specific may have just provided her with more universality than she thought. Be it be a Jewish nose, a bubbly personality, or an unforgiving desire to realize some elusive dream, Michele brings qualities to Rachel that are undeniably relatable. Whether or not you find yourself to be a fan of Glee or this episode’s insipration Lady Gaga, both preachy vehicles have rapidly expanded into widely recognized media commodities, with intentions of speaking directly to a young generation. In an episode devoted to self-love in the face of societal differences, seeing Rachel embrace her nasal prominence in the name of a Jewish icon was endearing. In a famous 1977 interview, Ms. Streisand credited her deviated septum with producing her unique voice, saying, “If I ever had my nose fixed, it would ruin my career.” So besides chutzpah, how does one account for the commercial appeal of Lea Michele, forerunner Barbra Streisand and fictionally Broadway-bound Rachel Berry? Perhaps they were just born that way. Lea Michele stated on national television that she was raised Catholic, and that her Jewish father was “glad” to go to church with her and her Catholic mother. That closes the book on that. Now, let’s pretend the last two and a half years never happened, and you guys in the Jewish press can start writing about people with two Jewish parents, like Joseph Gordon-Levitt, Logan Lerman, Mila Kunis, and Anton Yelchin. Actors of fully Jewish background: -Logan Lerman, Joseph Gordon-Levitt, Mila Kunis, Natalie Portman, Bar Refaeli, James Wolk, Julian Morris, Esti Ginzburg, Kat Dennings, Erin Heatherton, Odeya Rush, Anton Yelchin, Paul Rudd, Scott Mechlowicz, Lizzy Caplan, Emmanuelle Chriqui, Gal Gadot, Robert Kazinsky, Melanie Laurent, Marla Sokoloff, Shiri Appleby, Justin Bartha, Adam Brody, Sarah Michelle Gellar, Gabriel Macht, Halston Sage, Seth Gabel. Love that episode of Glee! Been actually thinking of having a nose surgery even before this episode aired. But I’ll have to do my personal research first before diving into the procedure.